The Pacific Crest Trail is one of extremes. Extreme weather, extreme terrain, extreme beauty, and extreme kindness. Each day I’ve had to push myself mentally and physically to meet my goal. The first day I caught the bus from San Diego to El Campo, arriving at the bus terminal just two minutes before the bus was scheduled to depart. The previous week (or previous day, rather) had been a flurry of last-minute gear and grocery store shopping, resupply box packing, bill paying, etc. I hadn’t truly had time to register the fact that my thru-hike was starting. Until that bus ride. I don’t get car sick, but all of a sudden I was overcome with nausea, and had to do some serious deep breathing to keep the vomit at bay. The doubts were flooding in. I tried to block out my thoughts and clear my mind. An hour and a half later the bus finally arrived in front of the Campo Green store. I bought fuel for my little Pocket Rocket camping stove and some water and set out on the 1.5 mile road walk to where I would start the trail, the Southern Terminus, on the Mexican border. On the way I was joined by Off-Center, who got his trail name on his thru-hike of the Appalachian Trail. He had been one of the ten or so other hikers on the bus with me, and we chatted about this and that, mostly how this walk was extremely hot and uphill, the final test before beginning the trail to measure your resolve. He told me he thought a quarter of us or less will finish our anticipated thru-hike. (Less than three weeks later he got off trail to tend to a previous injury that was acting up; TBD if he comes back.) 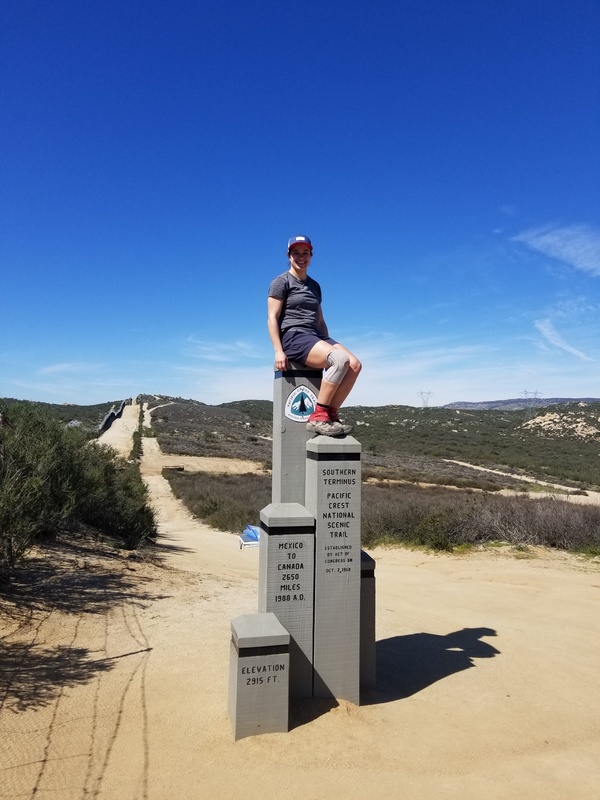 When we reached the monument at the start of the trail, a Pacific Crest Association volunteer was there to take our picture and give us some safety and Leave No Trace reminders. He gave me a couple of ziplock bags for my trash. People were already setting out when we got there and I was eager to get moving. That day I did my smallest day mileage-wise of the first week (7.5 miles), yet it was my most difficult day. I’ve never backpacked before. When I hike, I carry barely anything and sometimes even make my dog carry her own water. Yet here I was with around 30 pounds on my back, including food and water. I tried to be as ultralight as possible, but I’m also not about to shave my toothbrush handle, etc., or get too insane with it all. I started with a base weight of about 16 pounds because I didn’t want to spend thousands of dollars on an insanely light pack. I purchased all of my Big Three (pack, tent, sleep system) on closeout sale and much of the rest of my gear I received as Christmas gifts, yet I still spent a bunch of money on it all. Thru-hiking is expensive. Not having a job for five months is expensive. The trade-off can be a bit heavier gear. When a pack half the size of mine zooms by me on the trail I occasionally regret my choices, but for the most part I’m happy with my things. That day those of us that took the bus started late—around 11 a.m.—and the sun was strong and unforgiving all day. I had to take frequent breaks and everyone passed me at one point or another. Many people had done long hikes before and were bursting with advice. (This has been a common theme so far. Lots of opinions.) My sprained ankle hurt, my knee that the orthopedist said “is much older than you are” hurt, my feet hurt, my shoulders hurt. I was hot, thirsty. It took all my willpower to make it those 7.5 miles. Once I came upon several people who were starting to set up their tents I felt I could quit for the day as well. I had low expectations for the first day with my various injuries. But I’d made it more than a couple of miles, and my adventure was underway. It was around 4:30 p.m. at that point and now the sun felt great. The view on the side of the mountain where I had pitched my tent was gorgeous. Maybe this wasn’t going to be so bad after all. Maybe I could do this. Loved reading about your progress as well as your trials! You have the opportunity to do something that many are too afraid or have too many excuses not to try. Best of luck in your adventure!! The first step is often the most difficult and you’ve already accomplished that!